My favorite hit of last summer is back! A whole year has has past for this anime it is feels like it never went away! The new series sets it self up nicely. The Iwatobi Swim Club is desperate as ever for new recruits, while Rin has been promoted to Captian of the Samezuka Academy Swim Team. Also ‘Ole Captain Goro has bought and rebuilt the childhood swim club of our familiar cast, and has let Iwatobi use it during the winter season to prepare. After the usual swim competition between Haru and Rin that leads to a tie, The gang meets (Rin … kind of forced) back up at Iwatobi to reveal their opening of their pool. Far too cold to swim, Rin then reveals his dreams of swimming professionally is determined by nationals this year. The episode then ends with us, and Rin, being introduced to a new character, Sousoke. Will this be a new rival for Rin ? This was the best possible way to bring back the series for another summer. It felt as if the series never ended. In away I am glad we are not watching the usual “Rin’s battle against Haru”, and we get to see that the characters have moved past that… but of course we will see some friendly competition. The series is setting it self up for some interesting conflict. Will Haru ever act as seriously about swimming like Rin does? How is Rin going to make it this year being Captain and trying to achieve at Nationals? WHO IS SOUSOKE!? … and those muscles. 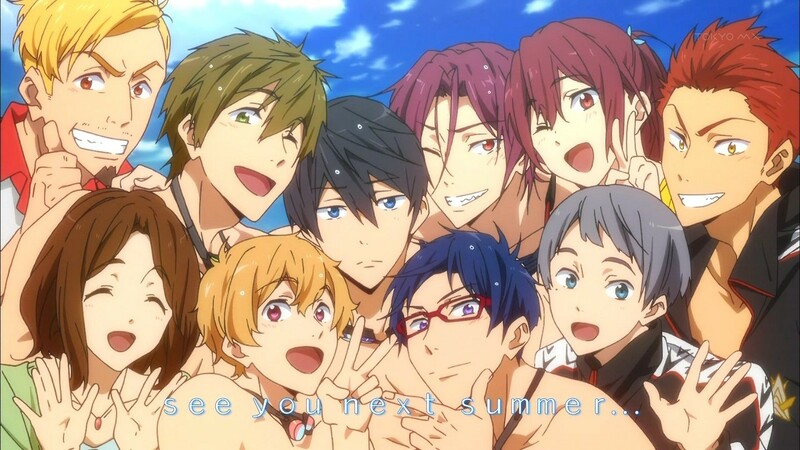 More than ever am I glad to be able to watch Free again, and I look forward to this Eternal Summer! Oh … and hey internet. To summarize the first season of Free! up in two words: “feels hurricane”. The last half of the show is what really brings it all together. The build up to and participation in the regional and national tournaments. You see that everything they’ve striven for has come to fruition. Free! starts off with four of the main characters, Haru, Makoto, Nagisa, and Rin, in their young swimming club days. Then it quickly flashes to the future when the boys are now in high school and their swimming together is in the past. Rin has came back from Australia and has sworn off swimming and attends a school away from Haru and the others. One day Nagisa convinces the boys the swimming again, and then other characters new and old join along the journey. Rin then sees his old friend and rival swimming again, and has to do everything to beat him, so he joins his school’s famous swimming team. The past bonds of theses characters are explored through out the season. Rin and Haru’s relationship with is the main focus of the show. “Something” had happened in the past and their reason for swimming was lost. With the help of Haru’s new teammate Rei (essentially the noob trying to replace Rin’s spot in the group), the reason of conflict becomes clear. The group then spends their club time preparing for the tournaments, while Rin spends his trying to one-up Haru, something he thinks will give him the happiness he wants. This last episode ties together and resolves most conflicts that came up during the show, and the tensions between Rin and the guys is finally closed as well at the National swimming competition. We really enjoyed watching this anime this season. This was defiantly a new genre for us to get into, but it wasn’t that hard to enjoy. How all the characters and themes of the show are wrapped together in the end is great. There are so many cute and heartfelt moments in the show that we would recommend Free! anyone. Yes, yes there are SO FREAKING MANY moments you can scream “GAYYYY!” at, but really after you turn off that weird fangirl side of yourself… the show, the STORY is amazing. Also watching the community and memes that came out of this show were hilarious, but after a while you just need stop looking at Tumblr…. And come on .. please have a second season!!! Anyway, this concludes our wrap up review of Free!. We plan to get back to regular posting as soon as the fall anime season rolls around. Story, foreshadowing, and floaties! This episode takes a slightly different route than we’re used to. It’s a lot more story driven than previous ones, and there are a few darker themes throughout. On top of all of that, there was surprisingly little fanservice. The focus was entirely on the characters, their pasts, and preparing for prefecturals. The episode leads off with Gou/Kou finding an old flier for a past Iwatobi Swim Club chapter. It describes their training regimen, which included swimming 1 kilometer between several islands, running circuits of the islands, and then swimming back. Gou/Kou suggests that they use this training regimen to prepare, and; in agreeance, they set off, preparing for the trip. They’re short on funds though, so they have to borrow a lot of camping supplies from Mako and his family. They also have to recruit their ex-swimming coach-turned-pizza-deliveryman Goro to take them using his squid fishing boat. He also supplies them an ice-chest full or pizza for free. While they were on the island they saw that Samesuka swimming club, including Rin, were also there. And even though it was just a coincidence, it inspired the Iwatobi Swim Club to train as hard as they could. On their first day they only completed half of their training regimen with everyone swimming and Rei using a paddle board. Rei couldn’t keep up with the rest and he thought he would be the one slowing everyone down. At the end of the day they made pizza and the boys head to the tents as Gou/Kou and Miho head to the lodge. While coming out of a convenience store, Gou/Kou runs into Rin and his friend, and they start talking about the rest of the group. Rin seems surprised that Mako is okay with swimming in the ocean, some heavy foreshadowing that gets more serious as the episode draws to a close. After their conversation, we’re taking back to the boys, who are sleeping in their tents on the beach. That is, all but one of them is sleeping. Rei has taken it upon himself to go out on the ocean by himself with a paddleboard at night, and the water quickly begins to get rough. It starts storming, and Mako wakes up, and when he goes outside, sees Rei in the water. He then runs and jumps in to save him, and the screen fades to black. This episode was one of the more suspenseful episodes, and actually lacked that fan service all those girls crave (Gates…). So more suspense = less fan service :p. There is also alot of back story that’s about to emerge from Mako. Is Free! really going to be okay with the fans if there is a lack of fan service? We think that the story of Free! will be more than enough to please, at least us. It’s finally happened…Rei learned to swim! It was a slow and embarrassing (albeit entertaining) journey, and it didn’t happen overnight. As the show kicks off, our fabulous foursome is having their first real swim of the year in the pool at their school. It’s still cold though, and at this point Rei still can’t swim. Nagisa thinks that they should all get matching uniforms. Everyone thinks it’s a good idea except for Gou/Kou, who has come up with a training regimen to get the group ready for the tournament. It includes one particularly daunting task, however: Teaching Rei to swim within a week. The training is slow going, and it seems like Rei is getting nowhere anytime soon. He thinks that his speedo might be to blame, so everyone heads out to buy new swimsuits. Once they are at the sportswear store, they all begin to try out different swimsuits, and it turns into a giant female fanservice montage. Haru runs into Rin as they both come out of the fitting room at the same time, and tells him that he wants to talk. Haru finds out that Rin doesn’t fell that his win against Haru counts, because Rin is in much better shape than Haru is, and wants a rematch. Haru then promises to swim for Rin, but only if Rin promises not to quit swimming if he loses. He agrees, and then storms off. The rest of the group comes out, and then head back to the school to keep teaching Rei how to swim. After Rei continues to embarrass himself, Haru finally agrees to teach him. After spending all that time learning from him, Rei is disappointed when he still can’t swim. They open up to each other though, when Haru tells him that he isn’t free. Something finally clicks in his head, and the next time the group comes to the pool, they find Rei there already swimming. He was doing the butterfly stroke, which he refused to do because he didn’t see the beauty in it until after his conversation with Haru. The show was FULL of ab rippling shots, of course, but we have the confrontation and race between Rei and Haru to look forward to. Next week’s episode looks kinda like a filler as the swim club goes on vacation. Delts, pecs, and six packs: a new episode of Free! must be out! I know we’re a few days late getting this out, but better later than never, right? Starting out shortly after where Episode 2 left off, Haru has a cold from swimming in the pool in April. His passion for swimming is admirable, but he seems willing to let nothing, even his health, come in the way of him swimming. The trio is working on getting a 4th member so they can do relays, but the task seems to be a little harder than they expected. Nagisa has his heart set on Rei Ryugazaki, a member of the track club who is very intelligent. Rei’s calculations turn into his downfall, however, when the coach praises him on his form, but says that’s all he has, which upsets Rei. He also becomes the main focus of the episode. Then, Kou/Gou arranges a joint practice with Samezuka, the private school that Rin attends. She says, however, that they need to have at least 4 members in order to do this though. This leads Nagisa to run with Rei in the morning on his way to school, getting to know him better, and trying to convince him to join the swim club, which he agrees to, but only as a trial member. 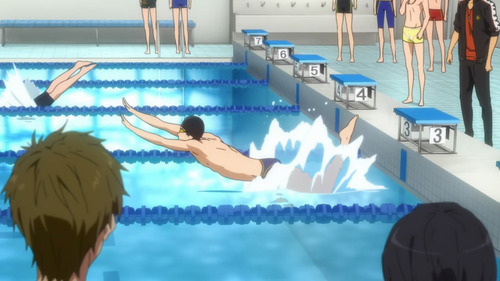 When they get to Samezuka, they start doing individual time trials. When it’s Rei’s turn, he starts calculating, and when he jumps in, he immediately sinks to the bottom because…wait for it…he can’t swim! The fact embarrassed him so much that, even after getting talked into swimming, he doesn’t tell anybody he can’t swim. After getting rescued from the pool, Rei watches Haru swim, and is suddenly full of admiration for him.Rei finally agrees to join the swim club as a full time member, wanting to be able to swim like Haru. This episode definitely set up a lot of further plot points, and set up some great storylines. It was fun to watch, and kept me wanting more. Can’t wait to see what happens next week! Splashing water, swooning teenage girls, rippling muscles, random stripping, and swimming. We could only be talking about one thing: Free! Episode 2 begins right where episode 1 left off, the race between Rin and Haru. You are left hanging and not knowing the results of the race. BUT at the beginning of the show it is assumed that Rin lost the race as he says “Does this mean I will never beat him? !” Then it flashes to the scene where Haru and the boys are being scolded by school faculty for breaking in to the school’s pool. 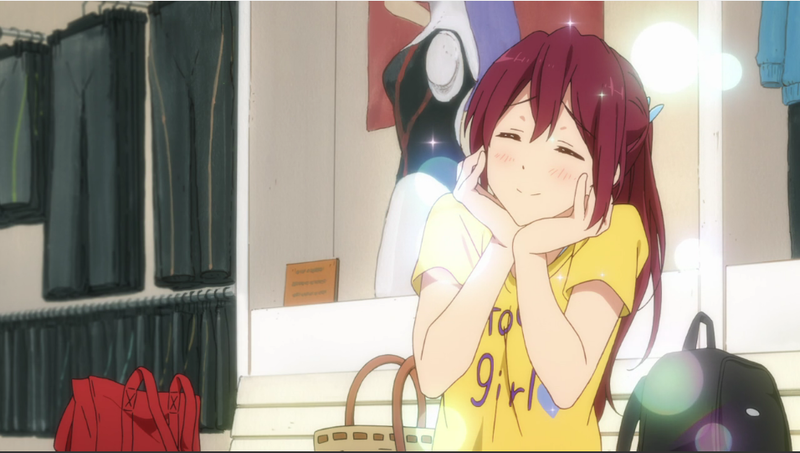 Gou (Rin’s sister that attends that same school as the other boy’s) ends up expressing our feelings when it comes to ALL the fan service for the ladies… We aren’t suppose to look, but we love it… maybe too much. Later the boy’s come up with the idea of forming a school swimming club to make use of the old pool on the grounds. They get their teacher , Miss Ama, to sponsor for them who use to work for a swimsuit designer. The swimming club is approved under the condition that they clean up the old pool for use. While cleaning up Mako and Gou get in the conversation of why Rin and Haru don’t swim anymore. It is revealed that Rin goes to the academy, but isn’t part of the swim club. Gou suspects that Rin has lost to Haru at the race at the academy, but Mako tells the real story. Rin had won the race against Haru. At this point you realize Rin is competing with the idea of winning while Haru doesn’t see winning as a factor, he just wants to swim. You end up seeing Mako’s home life between his family and siblings and you also see a flashback to the their childhood when he runs in to an old instructor that tells a story about when Rin came back for the first time from Australia in the winter and ran into Haru and they to their old club to race. Rin is defeated and breaks down, after going to study in Australia he still can’t defeat Haru. this is explained why Haru stopped swimming because he hurt Rin by winning. 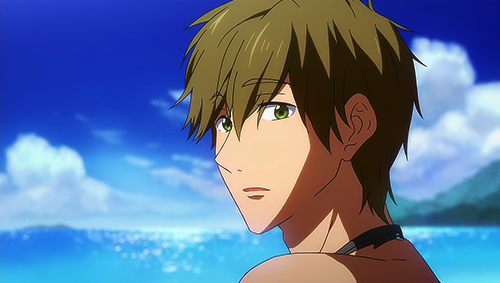 At the end of the episode you learn some much about the inner and outer conflicts of the characters, by the end Mako sees that Haru is returning to his “old self”. As they are opening the pool for the first time, even though it’s too cold outside, Haru strips down to test out the pool. AND NEXT EPISODE WE GET TO MEET PURPLE HAIR GLASSES GUY!